The latest technology of synthetic football pitch surfacing sees artificial grass fibres combine with sand and rubber infill to create a surface that replicates the characteristics of natural pitch both visually and the way it plays. The sand infill is used in an artificial football pitch because it helps keep the synthetic grass fibres standing up right whilst the rubber infill plays the vital role of giving the synthetic soccer pitch its playing characteristics. 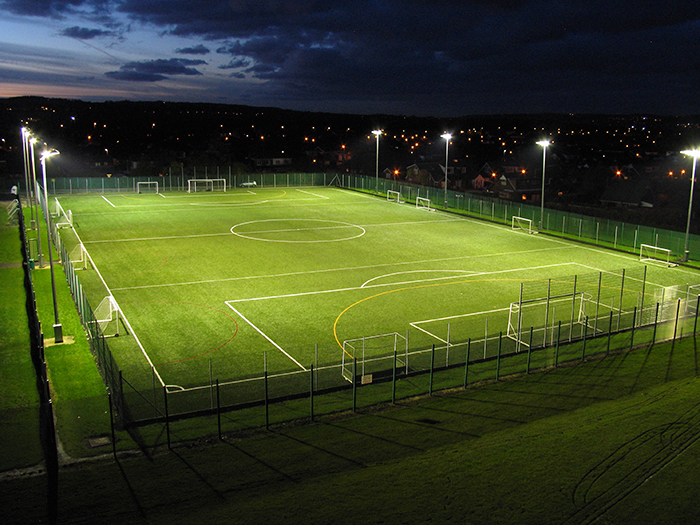 We are specialist football pitch installers and our team have completed work for numerous schools and clubs. 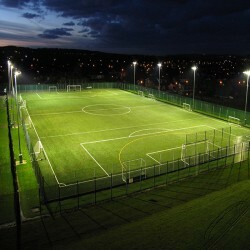 Click here - http://www.artificialfootballpitch.org.uk/installers/ to find out more or speak to our experts today. To discuss the different services we offer in more detail, or to receive a price quotation on the costs to build a new synthetic pitch please use our quick contact form. One of our local construction specialists will be in touch with you shortly to offer you some more information and professional advice. There are a number of different grades of synthetic turf and artificial grass available with the type of carpet along with the size and dimensions of the area determining costs and prices. 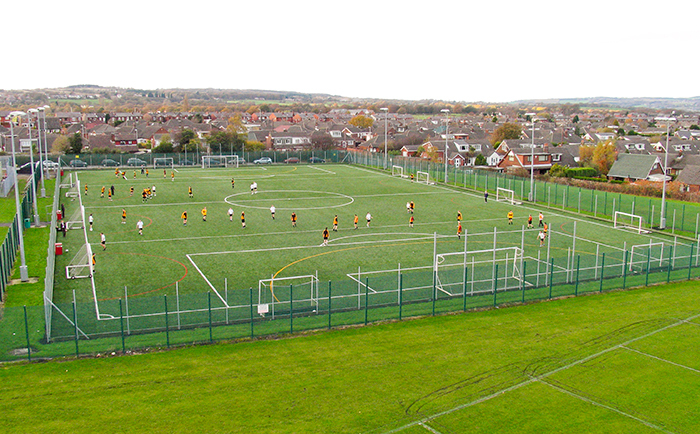 Often it is the budget of schools or leisure centres that determine the size of the synthetic soccer pitch as well as the specification of synthetic grass used to surface the pitch. The elite football clubs that surface their training pitches in synthetic turf usually opt for the FIFA 2* this is the top accreditation in foot ball for artificial pitches closely followed by FIFA 1*. These particular grades of synthetic carpet are unnecessary for primary and secondary schools as they usually only host recreational activities or competition and the mass participation end of the performance pyramid. 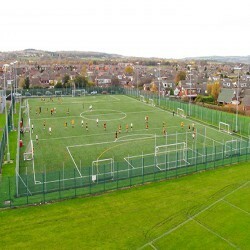 Depending on the type and size of facility you opt for, the football pitch construction costs http://www.artificialfootballpitch.org.uk/build-costs/ will be different so we recommend that you decide on a rough budget beforehand. We can carry out the installation of 3G pitches to create a professional pitch with excellent playing and performance characteristics. 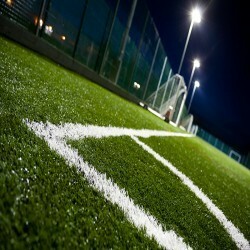 For more information on the synthetic grass we can install for soccer, please do not hesitate to contact us. We understand that some people may require a different company to carry out each stage of the process (e.g. a groundworker to carry out preparation work, etc.) and others may prefer to have just one company complete the whole installation. We are able to carry out works from start to finish so that you don't need to worry about getting others to complete small tasks. This makes payment and the constructions process itself a lot easier for you as the client. 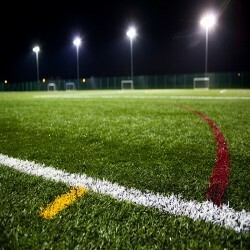 We also offer maintenance services http://www.artificialfootballpitch.org.uk/maintenance/ which allows the upkeep of a facility all year round. For more information regarding artificial grass and synthetic turf football pitches please contact us via the quick enquiry box. We will provide you with information about artificial turf specification, synthetic grass pile heights and costs and prices associated with constructing an artificial grass soccer pitch.